There's nothing worse than a snagging nail or rough, dry skin on your feet. Keep this handy, lightweight file in your handbag, kit bag, or travel case to keep your feet in tip-top condition. Use this diamond dusted file on thick nails and to smooth hard skin, also on corns and callous. 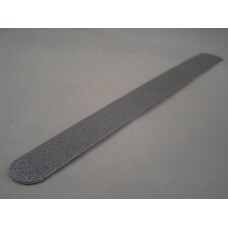 The 8-inch (20cm) nail file is made of stainless steel with two rough sides. For best results gently apply to dry feet and work off dead skin around the edge (not too hard as to damage healthy new skin). Wash the foot, blot dry and apply moisturiser. Comes supplied in a protective sleeve. To clean rinse under running water and scrub with a nail brush. Sterilise if used on multiple people.